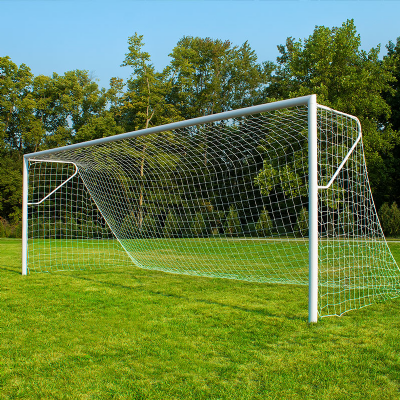 Official 24’ x 8’ (752cm x 244cm) Competition Steel In-Ground Goals. Meets all NCAA, FIFA and National High School Federation rules. Sturdy, economical, and easy to install and secure with a corner attachment design. Can be permanently mounted in concrete or removable when used with 505009 Ground Sleeves. All steel components feature powder coating. Order nets, optional backstays and ground sleeves separately. Posts are 4" (102mm) round with 14 gauge wall thickness. Order nets with backstays separately.